United Bank for AfricaOur Head office : U. B. A. House, 57, Marina,P. O. Box 2406, Lagos, Nigeria. 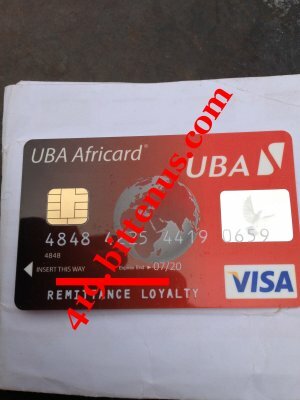 Thank for your mail i receive, this is to inform you that your ATM CARD is ready now,over this mail are the copy of your ATM CARD and the back up documents then below is the receiver's details to send the delivery fee of $190. 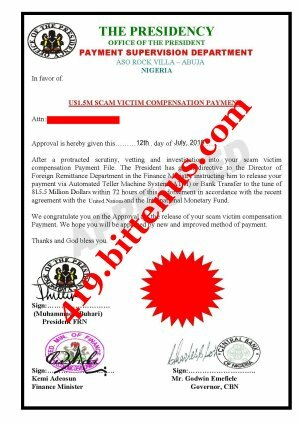 Once you have send it get back to us with the MTCN, call me or text me the MTCN on my phone : +2348147569514 and once it is confirm you will have your tracking details and in three (3) days you have your ATM CARD. Our Head office : U. B. A. House, 57, Marina,P. O. Box 2406, Lagos, Nigeria. over there to mail the money order. Union which will be more faster then money order.